Growing up in a village near the shores of Lake Victoria in Tanzania, Wanzita Ally never seriously thought about getting on a plane and flying to America. Her father had died when she was young, and she lived with her mother and grandmother, who were poor farmers. The family depended on what they grew in their fields to eat. But Wanzita loved school, and she did well. She was chosen as a class leader by her fellow students, and her teachers noted that she showed “good effort, behavior, and attendance,” despite going long periods without eating. She was determined not to let her family’s situation interfere with her education. Two decades earlier, in the early 1990s, a Peace Corps volunteer named Brian Singer was teaching mathematics at a high school near Wanzita’s village when he got to know four siblings whose parents had died. After Singer returned home to Minnesota, he talked to family and friends about helping those students with their school fees. The response was so great that he sponsored additional kids, and Project Zawadi was born. To date, the nonprofit has sponsored some 650 students. A few years ago, Project Zawadi began expanding its mission to help schools increase their educational reach, building classrooms and housing for teachers; installing toilets and computer labs; and setting up a vocational training center. One of the projects provided beds for a dormitory at Makongoro Secondary School, where Wanzita was a student. Wanzita herself received a school fee scholarship. Project Zawadi’s local partner organization, Zinduka, contacted the nearby Rotary Club of Musoma (Zinduka’s director, Max Madoro, later joined that club) to help with the Makongoro project. 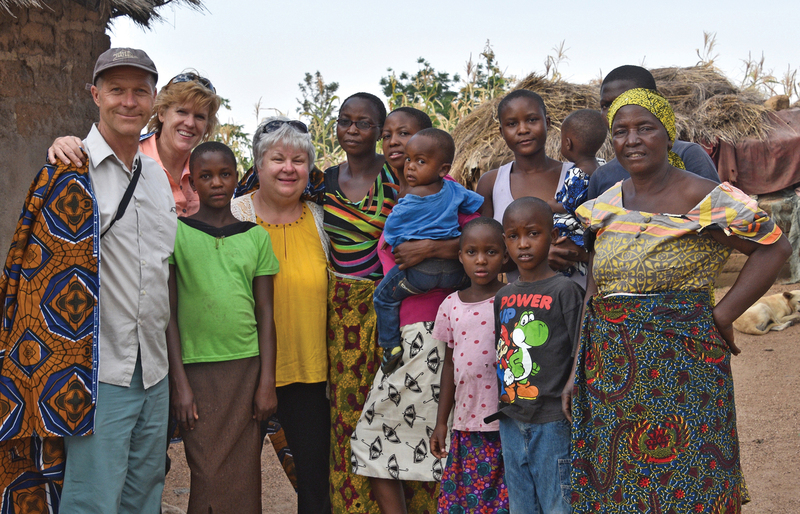 But the collaboration with Rotary didn’t begin in earnest until Vicki Dilley, a Rotarian in Northfield, Minn., who is also a returned Peace Corps volunteer, came on board as director. Dilley is also deeply involved in the North Star Youth Exchange, which is run by districts 5950 and 5960 (Minnesota and Wisconsin). One of the most active in the United States, it sends 60 to 68 students abroad each year and hosts students from other countries as well. Last year, because of Dilley’s connection, North Star decided to see about finding a student in Tanzania for a one-way exchange. Singer and Madoro looked through their files and decided that Wanzita had the qualities that would help her adapt in America, even though she had never been far from home. Project Zawadi set up a vocational training center and furnished a dormitory at Makongoro Secondary School. But Wanzita couldn’t embark on her journey without a passport. To get one, she needed a birth certificate. In order to get a birth certificate, her mother needed a birth certificate. So, accompanied by Madoro, Wanzita and her mother flew to Dar es Salaam, where they spent several weeks obtaining the necessary papers and stamps for her journey across the world. But over time, the strange new things seemed less strange. At her high school, where she spent her senior year, she joined the cross-country team and signed up for an ambitious load of classes, including child psychology, accounting, and biology. She has come to like American foods such as burgers, spaghetti, and, despite the cheese, pizza, but she still cooks ugali, a stiff maize porridge, from time to time. She sends photos and messages to her friends and family in Tanzania on her new smartphone. To see them, her mother goes to Wanzita’s old school, where a teacher pulls up the photos of her daughter’s life in America. Where that life will lead next, Wanzita isn’t sure. She wants to continue her schooling in Tanzania. She had thought about becoming a nurse, but now that she has been out in the world, she is imagining other paths.